How can math be used to calculate the distances, speeds, and travel times of minesweepers in the Mediterranean during World War II? Students will calculate distance, speed, and travel time of minesweepers based on ratios and scales on a map. They will learn about the role of minesweepers using primary and secondary sources, including ABMC’s Liberating Rome Interactive. The role of minesweepers was integral in securing the Anzio beachhead during the Italian liberation. Students will also demonstrate their knowledge of the role of minesweepers in a writing exercise. To prepare for the Anzio invasion and subsequent landings in the Mediterranean, the Allied forces deployed minesweepers to find Axis mines planted to destroy ships. These minesweepers ensured the safe travel of other Allied ships during an under-appreciated and lesser known, but integral, invasion during World War II. Mines were defensive measures to deter soldiers and ships from entering an area or slowing them down at the very least. A ship striking a mine could be sunk in under 20 minutes, as the USS Swerve demonstrates in the lesson. Summarize how math played a role in World War II’s Mediterranean Theater. CCSS.MATH.CONTENT.6.RP.A.1 Understand the concept of a ratio and use ratio language to describe a ratio relationship between two quantities. CCSS.MATH.CONTENT.7.RP.A.1 Compute unit rates associated with ratios of fractions, including ratios of lengths, areas and other quantities measured in like or different units. D2.Geo.2.6-8. Use maps, satellite images, photographs, and other representations to explain relationships between the locations of places and regions, and changes in their environmental characteristics. 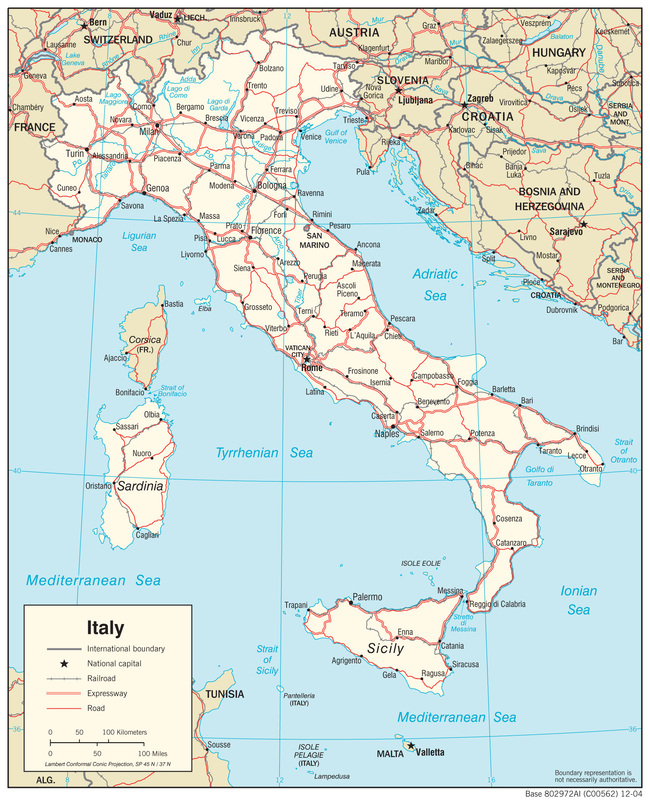 Print one copy of the Italy Map for every student. Write the opening question, How is math used in war? on the board. Direct students to the question on the board. Read the question aloud for the students, How is math used in war? Guide the answers towards appropriate responses (weights, distances, speed, etc.) if students are struggling. Write answers on the board for students. Confirm or add to students’ answers. Lead a class discussion to help students understand how math relates to war. Lead a discussion about the role of World War II minesweepers as well as Fireman First Class Bigelow Frisby’s history. Ask students to read the materials (individually or in small groups) and share what they have learned. What is the role of a minesweeper in a time of war? What happened to the USS Swerve? What was the experience like for sailors who served on minesweepers in the British and American Navies? Link students to the Liberating Rome Interactive and USS Swerve website. Distribute Italy Map to students. Demonstrate the Minesweeper Math Sample Problems with the class. Teacher Tip: The sample problems require students to calculate actual distance using a scale on a map and calculate the travel time for a ship to travel from one location to another. Sample problems and answer keys are included. This lesson used straight lines and distances have been rounded to make this lesson more accessible to younger or struggling students. Distribute rulers and give students the actual distance from Rome to Anzio. Instruct students to round the distance to the tens place. Have students create a scale using the inches to actual distance ratio. Use the scale at the bottom of the map (0.5 inches = 100 miles) to help students calculate the distance. Guide students as they complete the Minesweeper Math Sample Problems, offering assistance and redirection as needed. Teacher Tip: An answer key is provided in this lesson. Lead a classroom discussion about math and how it is involved in war; have students use specific examples from the lesson. Instruct students to write a one page summary of what they learned and why math was important in war, specifically World War II. Move about the classroom to assist students as needed. Students with more interest in the task of minesweepers can research other minesweeping missions and what daily life was like on a minesweeper in this or other theaters of war. Students can also have added rigor by using string to calculate exact distances between cities traveling along coasts instead of straight line distances. Teachers will find that this lesson is geared towards students with special needs. Students can be provided with read-aloud assistance for the websites and the documents provided. If necessary, simplified or summarized handouts could be provided for those still struggling. Teachers can group students to provide assistance as needed. Pairs would likely be the most effective and would work best pairing based off of ability level so that stronger students can aid weaker students. Translation sheets can be provided for English language learners. Alan Wheat teaches at Olde Towne Middle School in Ridgeland, MS. He participated in the 2015-2016: World War II in the Mediterranean Understanding Sacrifice program.